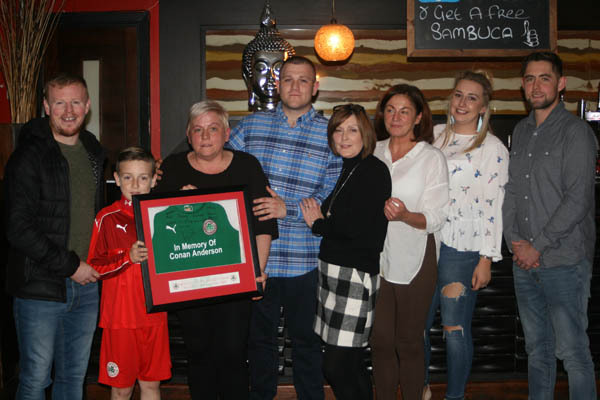 YOUNG football players from Cliftonville Football Club have donated a signed Reds jersey to the family of popular Short Strand football coach, Conan Anderson. The 22-year-old died after suffering a head injury on a night out in Belfast city centre in February. Conan was a popular football coach, who worked with kids from Doyle FC, based in his native Short Strand. Many past aspiring football players who were coached by Conan at Doyle FC now play for the Cliftonville U12 team. Joseph Farmer, whose son Nathan plays for Cliftonville U12s, said the youngsters wanted to do something in memory of much-loved Conan. “Conan was an influential young football coach who did great work with kids from Doyle FC in the Short Strand,” he explained. “All the kids loved him. He wanted to keep the kids off the streets. His work was amazing. He took kids who were potentially heading down the wrong road, used football to give them something to focus on in life. “Many of the kids at Cliftonville knew Conan very well from his time at Doyle FC. A lot of them used to play for the club before moving on to Cliftonville. They wanted to do something to remember Conan since he did so much for them. “A lot of the kids heard about Conan’s death in the news. I think when something tragic like that happens, it touches the entire football community. Reds legend George McMullan and young Nathan Farmer from the Cliftonville U12s team were on hand to present the Anderson family with the signed framed shirt.